I confess that reflection on “the judgement of sinners” and “the grief they suffer” is not a regular part of my practice of watchfulness. While I have been working on cultivating a continual remembrance of my mortality, meditation on eschatological reward and (especially) punishment has not always made sense to me, to be frank. After all, it is not I but Christ who will “judge both the living and the dead,” right? It would be a mistake to read this saying as if Abba Evagrius wanted us to be looking at others and forecasting their ultimate ends. There is a whole section in my version of the Sayings of Desert Fathers titled “That We Should Judge No Man”; the fathers routinely warn against the dangers of a judgmental mindset. A holy man wept bitterly when he saw someone sinning, and said: “He today: I tomorrow.” However grave a sin is brought to your notice, you must not judge the culprit, but believe yourself to be a worse sinner than he. Fair enough. So we need not be judgmental toward others in order to reflect on “the judgement of sinners.” The point is a sort of watchfulness that ought to engender humility. But yet, what does it all mean, really? What is this judgment? For that matter, what is “the good laid up for the righteous”? To some extent, perhaps it is wise to admit our ignorance. Yes, we all know the typical images of fire and torment, on the one hand, and the bright light, white robes, and heavenly bliss, on the other. But these are images. Images are necessarily connected to what they depict, but they are not identical with their prototypes, just as we are created after the image of God but are not, for that, God. That which is eternal is, in a sense, natural to us. We are, of course, temporal and mortal, but we are created after the image of God in order to be conformed continually into an ever closer likeness to him. “Eternity in their hearts”—and thus, if we reject that which is eternal, we will find a void within us: “‘Vanity of vanities,’ says the Preacher; ‘Vanity of vanities, all is vanity'” (Ecclesiastes 1:1). Perhaps this sheds some light on a different way of understanding those images of torment and condemnation. Just as the righteous experience now a foretaste (prolepsis) of what is to come for them as a natural consequence of the good they do, so also sinners—and so, to an extent, all of us—experience what is to come for them as an anti-natural consequence of the evil they do. We all face a thousand deaths daily, not only the tragedy of physical death, but the death of hopes, aspirations, dreams, desires, self-conceptions, and expectations. Just as with our physical deaths, the question is not whether we will die: that much is certain. Nor, to be precise, is the question about resurrection. That much, according to Christian dogma anyway, is certain as well. Rather the question is in what manner we shall die and, by consequence, in what manner we shall rise again. If we, through the sacraments and asceticism, are crucified with Christ and die daily with him to our passions and sins, then we rise daily to newness of life. If, however, we die estranged from God and thus from what is most real and the grounding of all reality, we rise to “the second death,” daily. We who are created ex nihilo (“from nothing”) have the choice, as St. Augustine so vividly illustrates in his works, between God who is the fullness of being, existence, reality, and life, on the one hand, and nothingness, an existential and metaphysical void, emptiness, negation, and non-being. In this way to be estranged from God is also to be estranged from ourselves. For what is virtue but a partaking of the life of God (cf. 2 Peter 1:2-4)? And if virtue is what is most natural to us, then failure to live in accord with it is a failure to live both according to the will of God and as our truest selves. Indeed, there is a death which begets new life. And there is a death which only begets more death, a vicious cycle of fleeting pleasures, comforts, securities, and the grief that follows from their loss. I do not know if, in addition to this, there is something more to the typical, “literal” understanding of images of the last judgment. But I do know that, in fact, “with what judgment you judge, you will be judged; and with the measure you use, it will be measured back to you” (Matthew 7:2). There is an ancient, Christian apocalypse that almost made it into the New Testament. It is attributed to St. Peter. 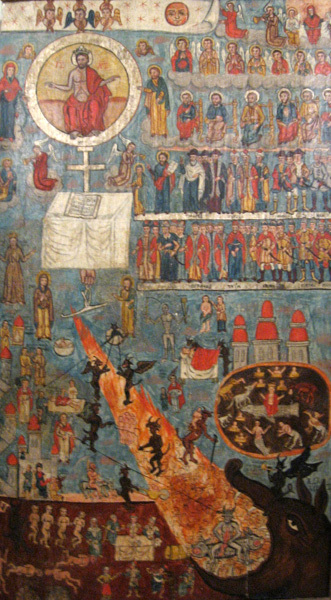 In it, among other things, the punishment of the damned is depicted in gruesome detail. Yet, aware that allegory was a common mode of expression for ancient peoples, I do not think that a literal reading would be correct or charitable. Or more accurately, I do not think that what is often assumed to be a literal reading is, in fact, in accord with the sort of literature (and, hence, truly literal) that an apocalypse is. I suppose it could be, for example, that “false witnesses” will someday literally be “gnawing their tongues and having flaming fire in their mouths” (Akhmim Fragment, 29). But I find it far more likely that the message here is rather about how when we sin with our mouths through deceit, it is through this very act that we are tormented. And if we pridefully cling to our self-tormenting self-justifications, the void we experience now will open forever into a great, bottomless abyss.